For her 2007 work Highwire, Yass commissioned French high-wire specialist Didier Pasquette to walk between three of Red Road's colossal structures. With a camera strapped to his head, and several others recording the event from various viewpoints, the resulting black and white footage documents his efforts to complete the crossing. Ultimately, the towers prove unconquerable. Although Pasquette mounts the wire several times, the extremely wet and windy conditions make the walk too dangerous, and the attempt is abandoned. Walking the tightrope between the Red Road towers fails, an apt enough allegory for their real-life fate (a phased demolition starting in spring 2010). Likewise, Yass's stated aim of "bringing together personal dreams of walking in the air with modernist dreams of a utopian ideal" is only partially achieved. Yet the still photographs taken to form part of Yass's eventual installation (left) bring the starkly beautiful presence of the towers to the fore, an appearance which, however else they may have failed, underlines their aesthetic force. Set against the vast, grey Scottish skies, these brutalist totems achieve the resonance of monumental sculpture, a notion not lost on Cyprien Gaillard: "I love Scotland because you go and there are fields of green, and then there are these structures: it's amazing. You can't not be moved, it's the laws of the picturesque. Formally, they just look so nice." 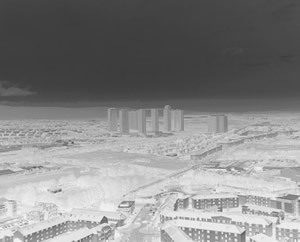 The notion of the tower block as the subject of an unlikely picturesque has been explored by many artists besides Gaillard. 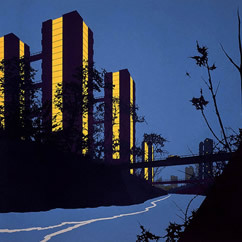 Londoner David Thorpe's early collage works, for example, pair nocturnal views of brightly lit, looming towers with delicate fringes of silhouetted foliage (left). More recently, Laura Oldfield Ford's detailed drawings provide grittily urban reconfigurations of the romantic ruin. The highly defined formal qualities of modernist architecture (which Gaillard terms its 'architectonical geometries') are also of particular interest. 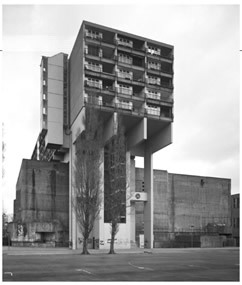 A series of images by young German photographer Boris Becker portray striking examples of German brutalist design. A former student of Bernd and Hilla Becher, Becker's similarly uncompromising documentary style perfectly captures the unlikely grandeur of his subjects (left). 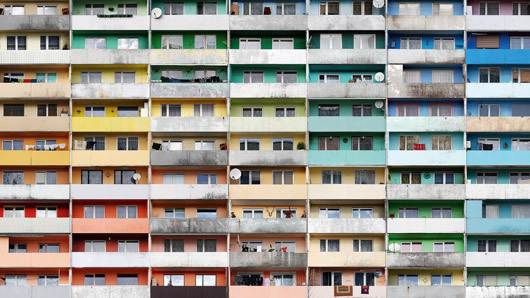 Another photographer, Swiss-born Nicolas Grospierre, has consistly documented Eastern European modernist architecture since moving to Poland in 1999. 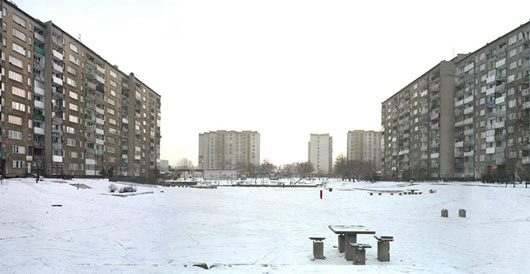 His panoramic vistas of Soviet-style housing projects depict vast, decaying concrete landscapes; victims of the entropic forces that assail their infrastructure, the passage of time has equally laid waste to the political, social and cultural agendas that informed their construction (below). 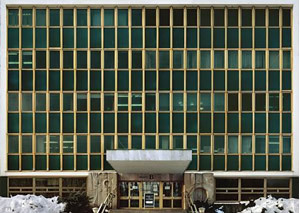 Yet Grospierre's photographs also attest to the rigorous formal integrity of the modernist ideal, with cropped compositions of official buildings providing perfect abstractions of gridded glass and concrete (left). And in other works, the dourly homogenous facades of residential 'blocs' are spectacularly undermined by their own inhabitants, each flat painted a different colour to kaleidoscopic effect (below).